Continuing its commitment to specialty, high performance knives, Gerber is manufacturing a Rescue knife version of the E-Z Out. The rounded tip design on the fully serrated sheep foot blade makes this safe to use in situations where you don't want to risk puncture. 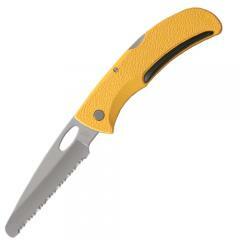 The E-Z Out Rescue knife features a yellow handle with black Kraton® non-slip rubber inserts.